The G.P.S. Tactical Backpack is made specifically to offer fast, sage and secure storage for all your fire arms, ammunition and accessories. These are made to be durable, stable for transport and water resistant to handle all kinds of weather. It is very roomy so that you can store all the things you need for the range. Keep reading this G.P.S Tactical Range Backpack review to find out more about all the features this bag has to offer. The GPS Tactical Range Backpack is excellent because it has three separate pouches for hand guns and extra magazine. It also has 4 zippered pockets for ammunition and other such accessories. The main compartment of the bag is huge, so it lets you hold a lot of stuff. It is divided into two sections so that you can split your gear into categories. The entrance pockets are roomy enough to hold onto your extra items such as EDC gear, flashlights, pens, phones, etc. The bottom of this backpack has a plastic case to store any cleaning equipment. There is also the storage room for safety shooting gloves, mag pouch, holsters, ammunition, ear defense, etc. Since the bag is so roomy, you won’t mess up the items you have in your bag and should find things immediately. You can put in a lot of ammunition, handguns and gear. This gps backpack comes with a rain protector tucked into a pocket at the back of the bag. In case you are in the outdoors a lot, this is very handy for sudden downpours and helps you to stay prepared for anything. Every compartment has a graphic indicator made of symbols to let you access your gear quickly. The magazine compartments and other storage spaces have a symbol which gives you a clue as to what should be kept inside your bag. It will also save time when you’re looking for a specific item inside your bag and makes it very easy to use. This tactical backpack from G.P.S is sturdy. It is made of nylon which was treated with DuPont Teflon making it a strong bag that holds its shape well. While internal pouches are a pressure point for manufacturers since they can tear easily, this sturdy backpack is well constructed so that even the inner pouches are made with nylon which makes it difficult to tear. Even though the G.P.S Tactical Range Backpack is slightly bulky, it keeps its shape well and does not collapse. It is durable and weatherproof, to last well in outdoor sessions. It also has a honey comb frame to ensure that the backpack is rigid and the MOLLE webbing system is triple stitched for protection. The G.P.S Tactical Range Backpack is made of a sturdy material which can hold shape on its own. The weight of the bag makes it stable on its own so that it keeps its shape and doesn’t collapse. But to supplement its stability, it has a padded waist strap to ensure that the backpack does not topple over. This bag has a Velcro loop to keep your paper goals rolled in place and has very high-quality zippers which will not break off. The zippers have a YKK locking systems to keep your guns in place so that it does not fall off the bag. Q: Because the state of California has new stringent handgun locking requirements, do the zippers on the bag lock? A: Yes, the G.P.S Tactical Range Backpack has three gun cases with a lockable, secure zipper. Q: What are the dimensions of the 3 mini packs? A: The exterior dimensions are 11 x 8 x 3 which can hold three full sizes 1911 pistols. If you have thicker pistols such as the Beretta 92 or Glock 21, then you can only fit in two. 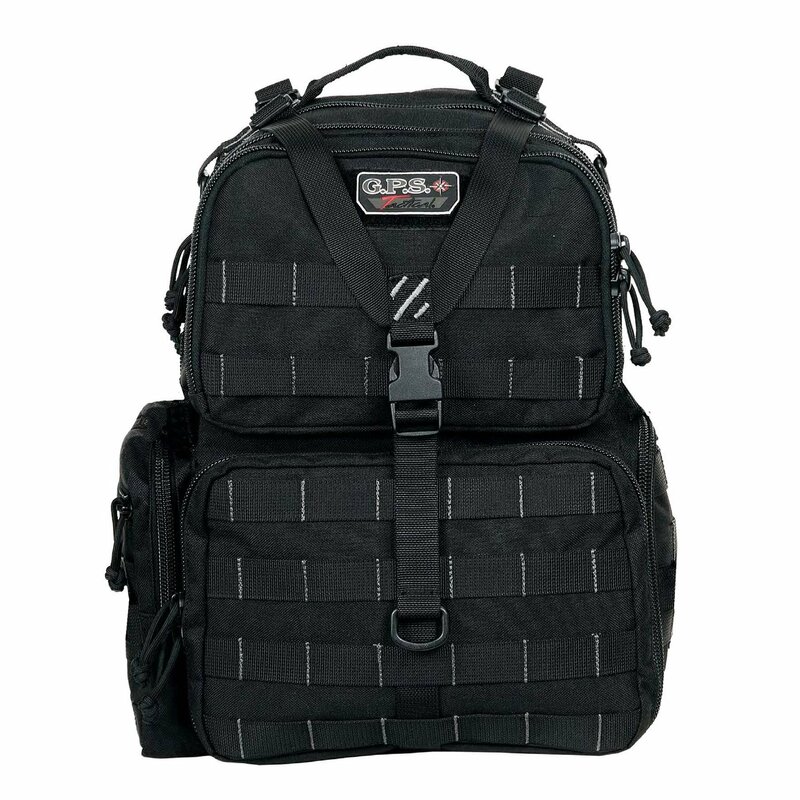 This tactical backpack is ideal if you are affiliated with multiple firing disciplines such as IDPA, 3 Firearm or UPSA. Since it is so well organized, you won’t waste time digging into the bag to fish out your things. Everything is easily accessible. It is very spacious for all your storing needs and is made of very sturdy material. This is the kind of bag, where you just need to buy it once to be a fan, and it will last you long enough for the next few years.